Dual-clock LFSR battery with external inputs and mixers. Suitable for the generation of random gates, digital noise, and pitched tones in the same manner as the classic Atari "POKEY" sound chip, with fully editable timbre for each of the eight outputs. The sound configuration is visually represented on a bar graph display, and a rotary encoder facilitates quick editing of each output. The Zorlon Cannon enables efficient exploration of the musical and statistical properties of LFSRs up to 16 bits in length. You can construct more complex sounds and sequences entirely in-module, by using one half of the module to clock the other. By using the onboard mixer to combine four channels into one, you can achieve dense drones, random CV sequences, or a precisely constructed flavor of digital noise. There are two clock generators each driving four outputs, with each half able to operate independently in several frequency ranges. Two independent clocks each driving 4 outputs. Top section is optimized for gates, bottom section is for audio tones. Internal clock generators have three frequency ranges and 1v/oct tracking. For cleanest audio and synchronized gates, an external clock input is provided. External clock input features optional PWM (sensitivity to both rising and falling edges). 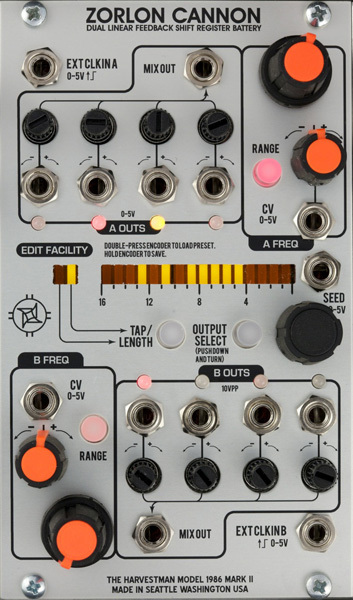 4-channel attenuverting mixer mixes outputs to one bipolar signal, with center detents. Each output is editable for shift register length and tap configuration, with the state of all 8 outputs storable in one nonvolatile preset. A gate input is provided for re-seeding the shift registers, to cause non-maximal tap configurations to "jump" into otherwise inaccessible sequences.